Bugs Bunny has been recuperated as a queer cultural icon, a parodic diva whose campy excesses and canny games are profoundly though tacitly indebted to the African American rhetorical tradition of signifyin(g). Interrogation of Bugs Bunny’s characteristic strategies of trickstering demonstrates the connections, both theoretical and material, between the queer camp of gender bending and the slippery strategies of resistance, the semiotic play of signifying as back-talk. 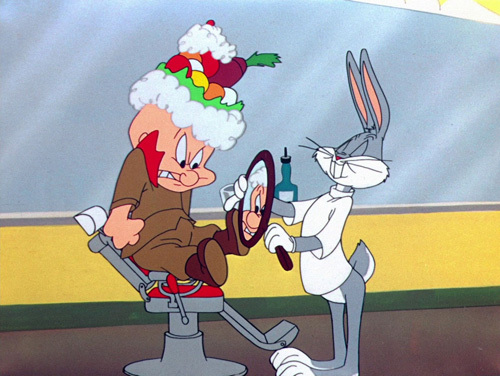 The rabbit of Seville (1950, directed by Chuck Jones and scored by Carl Stalling) presents specific situations of parody and allusion, illustrating the ways in which transvestic performance, inflected through camp, participates in a highly queer mode of phallic divestiture. This according to “The signifying rabbit” by Eric Savoy (Narrative 2 [May 1995] pp. 188–209). Below, excerpts from the cartoon classic in question. You used so many big words that I can’t tell if you are pro gay or anti gay… not that there is anything wrong with either one of those things… unless it was a huge slam, and then it was just a mite rude.